Andrew, standing on left, with his family in Tampa. 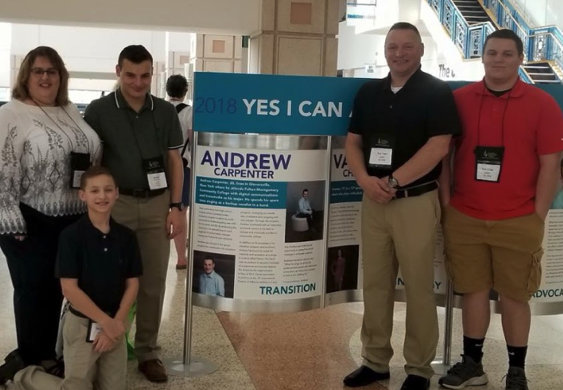 Andrew Carpenter, a student at Transitions of the Fulton County-based The Arc, Lexington, NY, today accepted a “Yes I Can” award from the Council for Exceptional Children (CEC). Andrew was one of only 12 students who received the prestigious international award. The presentation took place this morning at CEC’s annual Special Education Convention & Expo in Tampa. Andrew, who is affected by Autism, attends Lexington’s renowned Transitions program and is studying communications at Fulton-Montgomery Community College. He enrolled in Transitions after graduating from Gloversville High School in 2015. Andrew says Transitions is helping him learn a variety of skills to prepare for independent living, including organizational skills, managing money, cooking and social skills. His success in the program earned him the “Yes I Can” award. CEC is a professional association of educators dedicated to advancing the educational success of children and youth with exceptionalities. The “Yes I Can” program recognizes the accomplishments of students with exceptionalities in six categories: academics, arts, school and community activities, self-advocacy, technology, and transition. Andrew’s award is in the transition category. Andrew has had an enriching experience since arriving at Transitions in 2015. In July of 2016, he joined Lexington’s immensely popular band Flame as a vocalist after he was overheard singing in the hallway at Transitions. The group is made up of people with disabilities and has played on world stages, last traveling to Carpi, Italy, in May 2017 to perform at the 19th International Festival of Different Abilities.